Having done plenty of South African wine dinners and tastings over the years, we are always looking for food pairings that have some connection with a wine’s origin. Loads of dishes will work, but it adds a little bit of immersive flavour of a country having something local. As a result, I’ve done a fair amount of research on the Cape’s dishes and cooking, which is a real melting pot of different cultures and cuisines. The Boer settlers from the Netherlands introduced boerewors, a type of sausage and dried biltong, but also brought spices and curries to the Cape from the Dutch India Company. South African cookery tends to be very meat-centric, with the barbecue or braai being a focal point. Bobotie is stands out – as close to a national dish as you can find – and it’s been a go-to option for tastings and dinners at Berry Bros. & Rudd for years. We make small individual ones for tastings and more refined ones for our wine dinners, but I have also cooked it at home. It’s greats as a family meal, an interesting and flavourful alternative to shepherd’s pie or lasagne. Spiced minced beef or lamb is cooked down with dried fruit and topped with an egg and milk mix, then baked in the oven. My recipe here is a little smarter, using mutton shoulder that is flaked down with dried fruit; the mutton having a bit more flavour to stand up to the spices and working really well with the fruit. Having spoken with the Blog Editor earlier in the summer about a South African recipe, I thought I had just the recipe with my twist on this South African staple. 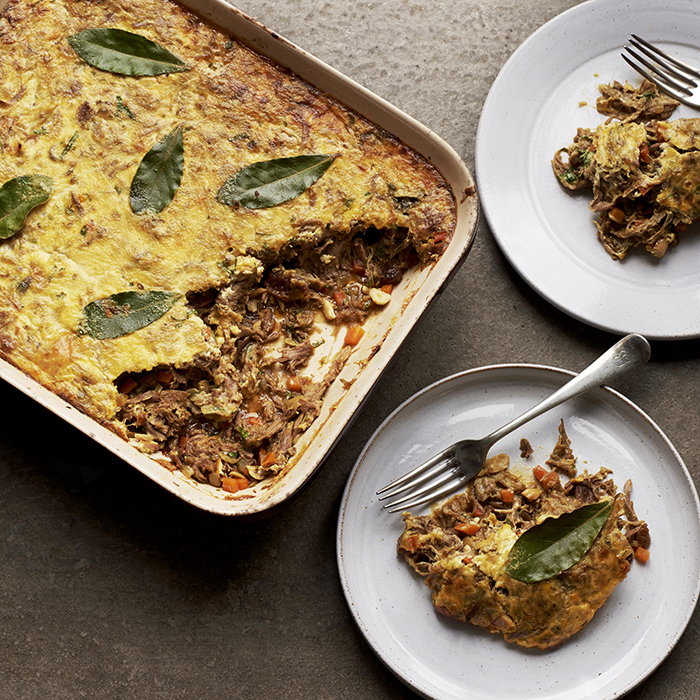 Imagine my dismay when I find out that Prue Leith’s new cook book is being serialised in one of the weekend supplements and – hailing from South Africa – one of the first recipes is bobotie. But, having made my decision, I’m pitting myself against a cookery legend: please be kind. Preheat the oven to 220°C. Slash the lamb shoulder on the fat side and drizzle with olive oil. Rub in all the spices, season with salt and freshly ground pepper, then leave to marinate overnight. Lay the onions in a suitably sized roasting tray with the thyme, garlic, cloves, allspice and cinnamon. Lay the lamb shoulder on top and cover tightly with a double layer of tin foil. Bake in the oven for 10 minutes, then reduce the temperature to 160°C and cook for a further 3.5 hours, or until the meat is falling off the bone. Once cooked, set the lamb aside but keep any of the onions and garlic that aren’t too scorched, popping the soft garlic from its skins. Discard the spices, drain any of the liquid and skim off any fat. Once the lamb has cooled sufficiently, fork the meat from the bone and strip down to small chunks, discarding the fat, gristle and bone. While the lamb is cooking, sweat down the carrots and onions in a good splash of olive oil until softened. Add the curry paste and cook out, then add the lamb stock and simmer until reduced by half. Fold in the braised shoulder, onions that were cooked with the lamb and the reserved cooking liquid. Mix in the dried fruit, nuts, mango chutney and chopped coriander. Season to taste and add the lemon zest. Place in an oven proof dish and press down, ensuring there are no gaps around the edges. Whisk together the eggs and milk. Pour the mixture over the lamb and lay the bay leaves on top. Bake for about 30 minutes, until the egg mix is set and starting to turn golden. What to drink: For a fully South African affair, Scions of Sinai’s Féniks Pinotage would work nicely – equally the spice of Syrah (try Mullineux or Craven’s Firs) would stand up to the dish’s curried edge. Stewart Turner, thank you ever so for you post.Much thanks again.